I don’t like to brag, but in the past year alone, I’ve submitted my resume to more than 500 employers, all of whom had one thing in common: they all shredded my resume after deciding that my stellar qualifications would make other employees look bad. I have, in the process, unlocked the key to what head-hunters are really asking for in their job descriptions. 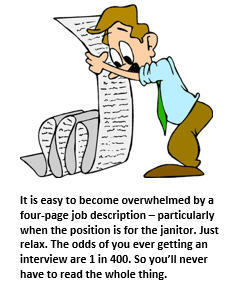 Recruiters don’t actually want to make it easy for you to understand what the position requires. But if you are one of the recruiters who is actually looking for someone with the qualifications and skills to do the job you require such as inside sales for example, you can learn how beat your competitors by hiring and retain top-performing Inside Sales representatives. If you are one of those however who does just insert into every job description a long list of trendy but vague buzz words designed specifically to obscure what the work really entails, then perhaps you won’t find the right person for the job. This is done to enhance the interview experience, providing prospects with the opportunity to explain how they can perform a job that no one at the company actually understands. Now, thanks to me, you no longer have to play their devious game. With this simple job description decoder guide, you can peel back the flaky crust of ambiguous nouns and adjectives to bite into the chewy center of what they’re really looking for. When decoded, what it really means is: You must be able to communicate only by means of TLA’s (Three-Letter Acronyms) and condense complex strategic marketing plans into email burps no longer than the 140-character count limit of Twitter. It really means: We haven’t got the foggiest idea what we’re doing, so you’ll need to figure things out on your own. Here’s the manual. Once you decipher it, would you mind explaining it to us? It really means: We generally like to blow up our business model and start over from scratch bi-monthly… And we expect you to go with the flow. 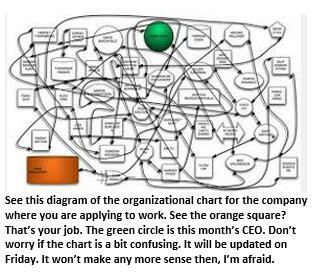 You don’t have a problem with having a new boss and completely new job responsibilities every six weeks, do you? It really means: We want all of our employees to lead balanced, fulfilling lives… just as soon as they retire. Until then, if you require more than five hours of sleep a night or insist on having a balanced life, this job may not be for you. Oh, and don’t even think about starting a family. Where is your dedication? We are committed to ensuring that all our employees have work-work balance. ADHD patients are encouraged to apply. It really means: Do you really need to know which department you work for? We’re from HR, and even we aren’t sure who we report to. Just pick a cubicle. Someone will eventually be around to introduce you to your new manager, who most likely is not the same person who extended you the job offer last Tuesday. They were transferred to our Simi Valley office on Thursday. It really means: This position is unusual in that it requires you to show up and actually produce demonstrable results. But don’t worry if you are not able to get the job done in the ridiculously short window we’ve allocated. By the time you almost finish, the company will have had another re-org, you’ll have another new manager, and your project will be shelved for the latest shiny object senior management has decided to chase. It really means: If you tell us that you actually can do the job, we’re going to be suspicious. After all, a committee of fifteen mid-level managers wrote the job description, and they’re pretty much sure it’s impossible for any single human being to do more than 30% of what’s listed. You know and we know that there is no way you can possibly do all requirements enumerated in this four-page job description. But if you lie with confidence about your qualifications, can conclusively prove that you have no immediate family within 500 miles, and are willing to give up anything resembling a normal life in pursuit of the two percent chance that the signing bonus stock options might actually be worth something someday, you may be just the kind of person we’re looking for. Good luck. Tim Jones is a humor writer based in Seattle and the one person to blame for the humor blog View from the Bleachers. Tim ponders important issues like “are all teenage daughters evil?” and “why does Montana hate me?” and “can your dishwasher destroy your marriage?” Tim’s not afraid to tackle controversial issues. He was the first techno-religion expert to conduct a side-by-side comparison of the iPad and Jesus Christ. From Politics to Parenting to Pop culture, if the subject begins with the letter P, Tim has something profoundly uninformed to say about it. Fun piece. I’d say something clever about it but it’s too early in the morning for that. Maybe later.